The nice things about a notebook and pen are that they don’t weigh much and you don’t need batteries. You can pull them out and sit on a rock or lie on some moss and be perfectly content writing about pleasant things such as the sweet spiraling off your brow as you hike directly up what appears to be a rock cliff called Tuckerman Ravine. Known as a “Skiers Mecca,” many make the trek up and down Tuckerman, skis, poles, boots and many layers of clothes in tow. The steep slope is covered in snow for half a year. At the trailhead there’s a buzz in the air that smells of pine, drying river mud and crushed leaves. A couple, decked out in polypropylene and hiking boots, spread a map between them, pointing out some trails. They show me topographic maps with a dramatic elevation gain of more than 4,200 feet. 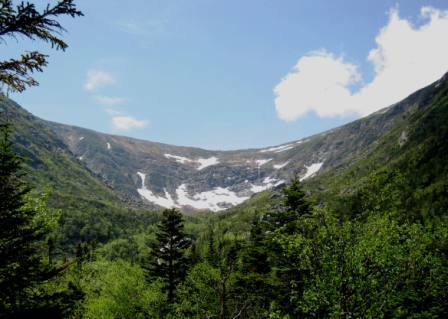 Located in the Cutler River Drainage on the east flank of Mount Washington, the ravine is in a deep pocket of the White Mountain National Forest. There are fathers with sons walking past, some with backpacks, most with walking sticks. One father cajoles a preteen to think of the stories he can tell back home in Connecticut about climbing to the top of Mount Washington. The boy appears to listen and keeps his trudge straight up the trail. Women travel in packs of threes and or fours, and they chat and laugh, energized by the scenery of friendship and nature. My notebook gets filled with images of hikers, chattering squirrels and the curve of a ravine’s wing upon granite ledge. 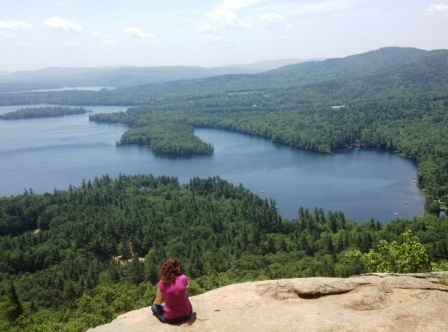 Driving up toward the picturesque town of Holderness, Rattlesnake Mountain is a hike with a view of Squam Lake. Famous for being the locale used for “On Golden Pond,” Squam Lake sits in sapphire brilliance below Buster and me. Buster chases squirrels and chipmunks up into trees and under fallen logs. The air is clear and strong at the top, and whitecaps are whipping the lake into a frenzy. Boats bob and a water skier creates a miniature wake as I take in Carr Mountain, Mount Kineao and Stinson Mountain. Although a little more than 1,500 feet in elevation and a quick 1-1/2 miles round trip, this is a hike not to miss for the 360-degree view of mountain blending into lake. It was the perfect moose marsh. Mucky, with swarming mosquitoes, in hidden Bog Brook near Jackson. I was determined to find the elusive moose of New Hampshire, without a guide, without a plan, without common sense. I had Buster, my ever-fearful Labrador retriever, as a sidekick, and a couple of maps. It couldn’t be difficult. There were plenty of “Moose Crossing” signs around here. So, that meant it wouldn’t be long before Buster and I saw a moose. Buster and I had checked in earlier at Whitney’s Inn, a classic lodge perched high on Black Mountain. With its log hewn furniture, plaid blankets, wood-burning fireplaces and framed portraits of moose and bear, it was the perfect site to have a base camp for moose watching. “I’ll find one,” I told him. Henry David Thoreau chronicled seeing moose while hiking routes upstream and downstream of the Concord, Pemigewasset and Ammonoosuc rivers. So, Buster and I took a clue from Thoreau and continued along Bog Brook until we hit the muddy tributary of a stream. There was no bridge to hike over, so we waded through. The crossing didn’t go well. I had to carry Buster. According to New Hampshire Fish and Game, an adult moose can average 1,000 pounds and stands more than 6 feet at the shoulder. They’re near-sighted, but have excellent senses of smell and hearing. Buster and I had been rather loud on the trail. I decided our next plan of action was to be quiet. I also sprayed more Deep Woods Off on the back of my neck for sensory camouflage. The optimum time to see moose is either early morning or dusk. It was midday when Buster and I came to the bottom of a moss-covered basin. A small waterfall sent plumes of cool spray over us. Columbine curved over granite, and the squirrels chattered overhead, flipping from one branch to the next. Buster chased one, then another, and caught nothing. I pulled out a peanut butter sandwich and my guidebook. “Moose” is an Algonquin term for “eater of twigs,” and they munch on large doses of shrubs and buds of hardwood and softwood varieties. They eat 40-60 pounds a day, to be exact – willows, birches, aspens, maples and fir. In the summer, moose feed on aquatic plants in marshes, streams and ponds. The book says nothing about waterfalls. So, Buster and I kept on with our moose roam. After hours of mud, branches, boulders and streams, it was dusk. A half moon rose in the sky as bats, careening above us, gobbled swarms of mosquitoes. Fallen trees from the windstorm of last winter lay in pick-up-sticks array as Buster and I climbed over branches and broken tree trunks. Ahead of us, No Ketchum Pond awaited. The water took on the hues of the sky, pink and deep purple, and in the distance, there was a rumble of thunder. Back at our moose compound, there was microbrew on tap, burgers to be found and respite from moose tour failure and multiple mosquito bites.